The book of Numbers contains a lot more than a census of the Israelites. Paul tells us we must learn from the wrong choices of God’s people in the past. At first glance, the name Numbers may not sound appealing and interesting. But those who study the book may be surprised to discover it teaches many spiritual principles and lessons. It’s a book of history that records many of God’s miraculous deeds as the Israelites wandered in the wilderness. Numbers is so named because a census of Israel is taken twice in the book. The first census was completed while the Israelites were still at Mount Sinai (chapters 1-2), and the second one came 38 years later when they arrived at the borders of Canaan at the end of their wanderings in the wilderness (chapter 26). The book’s English title originated with the Greek Septuagint version of the Bible. In the Hebrew Bible the book is referred to by a Hebrew phrase in the first verse of chapter 1 that means “in the wilderness.” This is a more complete designation, since Numbers contains the history of Israel wandering in the desert from the time they left Mount Sinai, in the second month of the second year after the exodus, until they arrived in Moab, near the borders of the Promised Land, in the 10th month of the 40th year of their journeying. So Numbers is a sequel to the book of Exodus. The Creator God made His presence visibly known among His people. “Now on the day that the tabernacle was raised up, the cloud covered the tabernacle, the tent of the Testimony; from evening until morning it was above the tabernacle like the appearance of fire. So it was always: the cloud covered it by day, and the appearance of fire by night” (Numbers 9:15-16). The people moved on when the cloud was taken up, and when it settled down, they camped. The Israelites understood that as long as the cloud rested over the tabernacle, they were to remain camped in the presence of God (Numbers 9:17). The tribes were arranged in order around the tabernacle, where God’s presence was located, with the Levites in the middle. Today we don’t have a tabernacle with God’s presence as the ancient Israelites did, but Christians are encouraged to draw near to God, and He promises to respond in a very personal way (James 4:8; 2 Chronicles 15:2). Despite God’s day-and-night presence in their midst, the people were guilty of constantly murmuring and grumbling, even to the point of wanting to choose a captain and return to Egypt (Numbers 14:4). 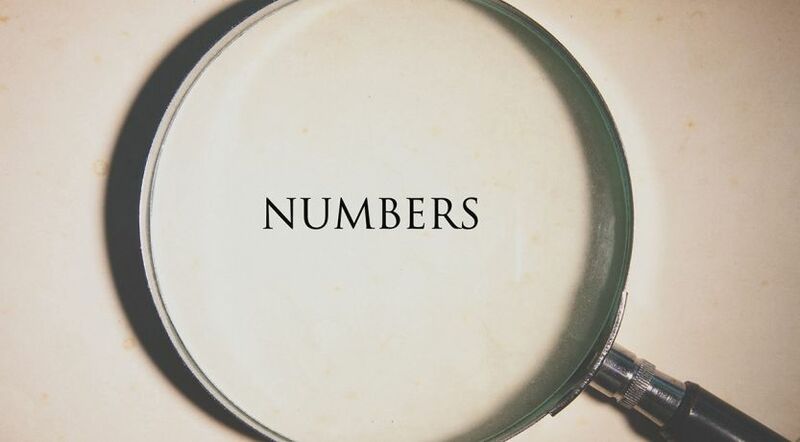 “Numbers, therefore, is not a mere bit of ancient history but … it is a complex story of unfaithfulness, rebellion, apostasy, and frustration, set against a background of God’s faithfulness, presence, provision, and forbearance” (William LaSor, David Hubbard and Frederic Bush, Old Testament Survey, p. 99). The people soon forgot the hardships of Egyptian slavery and lusted after the foods of the land of their captivity (Numbers 11:4). They lacked gratitude despite God’s providing for their daily needs. Their complaining and unfaithfulness displeased God and disqualified that generation from entering the Promised Land (Numbers 11:1). The apostle Paul referred to this incident and others with a warning that we should not follow the bad example of the sinning, murmuring, complaining and griping Israelites (1 Corinthians 10:10-11). Moses on a number of occasions acted as personal intercessor on behalf of the people. When Miriam and Aaron expressed jealousy toward Moses, God’s anger “was aroused against them.” Miriam was stricken with leprosy, and Aaron appealed to Moses: “Oh, my lord! Please do not lay this sin on us, in which we have done foolishly and in which we have sinned.” Moses then interceded; and after seven days of banishment outside the camp, Miriam was healed (Numbers 12:9-15). When the Israelites rebelled at the report of the returning spies, God threatened to disinherit them. But after Moses’ intercessory prayer, God pardoned the iniquity of the people, although they were still not allowed to go into the Promised Land (Numbers 14:1-23). There are numerous examples in the Bible of righteous individuals interceding on behalf of others. Christ is the greatest example of all (Luke 22:31-32; John 17:20-21), interceding on our behalf in many ways, including acting as our High Priest (Hebrews 7:25; 1 John 2:1-2). Other well-known examples include Abraham pleading for Sodom (Genesis 18); Job praying for his friends (Job 42:10); members of the Church praying for Peter in prison (Acts 12); and Samuel praying for the Israelites (1 Samuel 12:18-23). God is looking for people who will intercede on behalf of others in fervent, heartfelt prayers (Isaiah 59:15-16; James 5:16). Numbers 12:7 in Hebrews 3:5-6. Numbers 14:16 in 1 Corinthians 10:5. Numbers 17:8 in Hebrews 9:4. Numbers 19:1-9 in Hebrews 9:13. Numbers 22:5 in 2 Peter 2:15; Jude 1:11; Revelation 2:14. Numbers 27:17 in Matthew 9:36; Mark 6:34. The statement by Christ about “sheep having no shepherd” occurs first in Numbers 27:17. Chapter 1: Numbering (census) of the people. Chapter 2: Organization of the families in the camp. Each family had a standard—an ensign or signal flag (Numbers 2:2). Chapters 3-4: Assignments of the priests and Levites. The Levites were chosen to do God’s service in place of the firstborn, and in these chapters the duties of the families of Levi—Gershon, Kohath and Merari—are identified (Numbers 3:25-39). When transporting the Ark of the Covenant, the priests (and no one else) first covered it. Levites were forbidden to touch the sacred articles. Chapter 5: Laws of defilement. Chapters 7-10: Final instructions and events before departing Sinai. Much of chapter 7 deals with the offerings that the leaders of Israel brought to the tabernacle when the altar was dedicated. The first 10 verses of chapter 10 describe the various uses of trumpets, and on what occasions and for what reasons they were blown. For instance, the two silver trumpets were used to send a signal to the entire congregation. Other occasions are described, such as calling leaders (Numbers 10:4), an alarm of war (verse 9) and announcing festival days (verse 10). The second part of chapter 10 pictures Israel departing Mount Sinai (verses 11-13), with the Ark of the Covenant leading the way (verses 33-34). Chapter 11: Only three days after their departure from Sinai, the people started complaining! This attitude of ingratitude greatly displeased God, who struck the outskirts of the camp with fire to teach them—and us—an important lesson. They showed an abject lack of appreciation for what God had done for them. Consider Moses and the lessons we can learn from what he experienced. The reaction of the people so discouraged him that he reached a point where he asked God to kill him: “Please kill me here and now” (Numbers 11:14-15). As we read about the various incidents in the book of Numbers, we notice how ingratitude undermines faith and produces a chain reaction in human nature. Always wanting more can produce bad results (James 4:1-3). Chapter 12: Miriam and Aaron were critical and disrespectful of Moses, most likely due to envy. God again backed up His chosen servant. Miriam was stricken with leprosy, and Moses prayed for her healing. God answered his prayers. Chapters 13-14: The 12 spies were sent to Canaan. Ten of the spies brought back an “evil report,” which resulted in the entire nation rebelling against God. They lacked faith in God’s power and might to fulfill His promises, and they feared human beings more than Him (Numbers 13:28). The people lamented, “If only we had died in the land of Egypt! Or if only we had died in this wilderness!” (Numbers 14:2). So God gave them their wish! By refusing to accept God’s judgment, the Israelites would wander 40 years and that generation would die in the wilderness before their children inherited the Promised Land. This incident was followed by another sin, that of presumptuousness (verses 39-45). This provides another lesson we must learn. Chapter 15: Various laws restated. Chapter 16: Another example of rebellion against God’s constituted authority. Korah, a first cousin to Moses, and 250 leaders accused Moses and Aaron of taking too much authority. It seems they were more specifically targeting the priesthood. These dissenters wanted to muscle in on the power base and appoint themselves to positions of authority. They undoubtedly had convinced themselves that their motives were noble, but God knew better than they did what was really in their hearts. The contentious leaders refused to recognize that they were in rebellion against God, who had appointed Moses and Aaron in the first place (Jude 1:10-11). The result was that the dissenters were destroyed (Numbers 16:31-33). Unbelievably, the very next day the people complained against Moses and Aaron, and Moses had to again intercede on their behalf. Chapters 17-20: The incident of the budding of Aaron’s rod is described. Twelve rods, one from each tribal family, were placed in the tabernacle, but only Aaron’s rod miraculously produced buds, blossoms and even ripe almonds to demonstrate God’s support (Numbers 17:8). Duties and responsibilities of priests and Levites are outlined in chapter 18, while chapter 19 deals with ceremonial cleanliness. The Israelites moved from Kadesh to the plains of Moab in chapter 20. Along the way first Miriam died (20:1) and then Aaron (verse 28). During this time Moses made a terrible mistake that cost him entry into the Promised Land. The people once again complained that they had no water. God told Moses to speak to the rock; but instead, Moses in anger spoke to the people and then struck the rock twice (20:12). Another lesson for us all: We must take God’s instructions seriously and follow them exactly. The Bible warns us not to lean on our own understanding (Proverbs 3:5-7). Chapter 21: Canaanite tribes attacked Israel and were defeated. Because of the Israelites’ complaining, “fiery serpents” entered the camp. God told them to mount a bronze serpent on a pole and promised to heal those who looked on the pole. Chapters 22-25: Balak, the king of the Moabites, instructed Balaam to curse Israel, but he was unable, as God prevented him from doing it. However, Balaam advised the Moabite women to entice the men of Israel into adulterous pagan rites so God would punish them (Numbers 25:1-9; Revelation 2:14). Chapter 32: Land on the east side of the Jordan River was given to Reuben, Gad and half of the tribe of Manasseh. Chapter 33: This chapter reviews the history of the wanderings for 40 years in the wilderness. Chapters 34-36: Eleazar the priest and Joshua divided up the inheritance of the land (chapter 34); specific cities for the Levites were set aside (chapter 35); and judgments regarding inheritance were refined (chapter 36). Numbers contains many spiritual and moral lessons, and it is a book of testing and faith. We can learn such lessons as showing gratitude instead of grumbling and complaining, accepting God’s appointed leadership and following God’s instructions. Sin brings devastating results. It is God’s desire that we not repeat the mistakes of the Israelites of old, but rather that we respond to and follow His truths outlined in His Word. This is the hope we have to enter our Promised Land—the Kingdom of God—as children of God. These links will give you more about this inspiring future that God wants to motivate us.